Let our plans inspire you! For forty years most of our handcrafted log homes have been customized to meet a client’s unique needs: plan ideas are just to get you started. Contact us and tell us what you’re hoping to build…we have over 100 plans available: from quaint log cabins, impressive log ranchers, luxury log chalets, and post & beam designs: just include the approximate square footage you need and we’ll provide more plans. 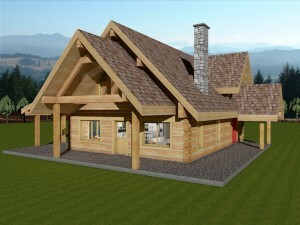 If you’ve already found a log home plan you like, email it to us and we’ll work with it. Sometimes a picture is worth a thousand words: sketch out your own ideas and let our dedicated log design specialists turn your dreams into your dream home! Total Living: 1404 sq ft.
Total Living: 1590 sq ft.
Total Living: 1402 Sq. Ft.
Total Living: 2880 Sq. Ft.
Total Living: 3709 Sq. Ft.
Total Living: 3955 Sq. Ft.
Total Living: 5452 Sq. Ft.